Which happened a few hours ago. I had won the Atlanta Gator Club SEC ticket lottery earlier this year and purchased two SEC tickets. I knew the Gators were a long shot based on our prior season, but I never rule anything out. See our own wedding scheduling conflict with the Gators' 2006 appearance in the Final Four. WHOOPS! Just last week, I had reserved our sitter for the good part of the December Saturday that the game was to fall on. I allowed myself to hope. Yes, it is awesome and exciting to cheer on your team in the SEC championship game, but for me, it was far deeper than that. It was a throwback to when I was fun and carefree. I remember spending all day tailgating down at the Georgia Dome. Drinking my fair share of cheap wine and mimosas. Stuffing my face with all sorts of diet-killing food. Taking tons of inappropriate photos that, thankfully, didn't end up all over Facebook. Spending the day with friends that I didn't get to see all that often. Could this be? Would I actually have a chance to go and do something fun again? So right about the time Jordan Reed coughed up that touchdown ball, I wanted to cry (so did he). Not really because we lost, because we always lose at some point. Not even because it was such an ugly, ugly game. But because it meant there would be no fun football game for me. Not this year. Thanks for that, Gators. We are breaking up. You really let me down. On a related note, I've got two SEC tickets for sale. I plan to take the proceeds and do some retail therapy. Or maybe the spa. 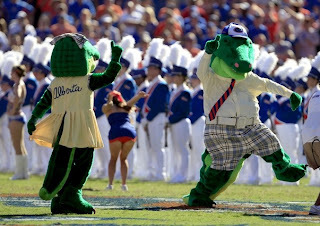 Not even fake alligators dressed in fancy clothes can cheer Mrs. Yoy up.